Fear, Intuition & Intention, Oh My!! Last week we starting talking about “If I can’t, I must”. This week we are going to delve deeper into fear and how we can overcome it to move forward in our lives towards our dreams. You may have heard before that fear stands for “False Evidence Appearing Real”. But how can you discern false limiting fears from intuition which could keep you safe? Your intuition is never wrong. It is your spirit self, your inner knowing. If it’s telling you not to do something, a good indicator will be that you will feel it in your gut. It is literally your “gut instinct”; the mammalian part of your brain. Let’s use an example of taking a job across the country. You receive a call that you have been chosen for your dream job, however, it’s in California. You would need to move your family across the country and leave your friends and family in Georgia behind. Although this job feeds your soul and allows you to truly make a difference in the world, the cost of living difference means you would be making less money. What do you do? How do you decide? First, you must get quiet. Focus on your breathing, emptying your mind of all thoughts. As you get still and centered, begin to think about the new job. Say out loud, “Is this new job in the highest good for all involved?” Now, pay attention to your body. If you feel a tingling sensation in your gut, that is your intuition giving you the go ahead. If your mind begins to list all of the reasons why you shouldn’t take the job; leaving your friends and family, finding a place to live, starting over, that is fear. Fear rambles. Fear makes excuses. Intuition is a feeling and it is never wrong. So what about fear? There are three fear responses we can experience – Fight, flight and freeze. These are reptilian brain responses. Most of us are familiar with fight or flight. If you are being chased by a bear, you can either flee, stay and fight him, or freeze in place becoming a tasty snack. Sometimes we do freeze in the face of fear. We may be perched on the edge of something great, but we freeze, not able to take action. This is actually the lowest rung of the fear ladder. You want to stay in motion. If you are fleeing or fighting, at least you are moving. So how do we move through fear to make our dreams come true? First you must imagine that which you really want. Picture it. Set the intention that it is already yours. Experience the conviction that you can have it. You deserve it. You just need to claim it. 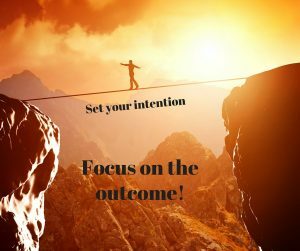 Once you set your intention, focus on the outcome, let’s say, a loving and committed relationship. Now here is the kicker. While focusing on the outcome, you must then let go of being attached to the outcome. Let me say that again. You set the intention, focus on the outcome and then let it go. This is vitally important. If you have sent the intention that you want a loving and committed relationship, but are attached to that person being blond, 5 feet 11 and ¾ inches tall with a tattoo of a snake running down his forearm, you may miss the ten men who are ready to be loving and committed and possess the true qualities you are looking for. By releasing the attachment to the outcome, you are open and leaving space for the right and perfect relationship, job, or opportunity to come to you. If you want to be attached to something, be attached to the journey, not the outcome.